It’s not often you go to a museum to watch a gig, but if there had to be one, then that would be the V&A! Known for putting on some of the finest exhibitions on music history from the revered David Bowie exhibition to the Pink Floyd one, it only seemed like a suitable place to home Seven Decades: The Story of Three Guitars That Changed The World. This rock n roll experience is co-created by Phillip Hylander and Michael John Ross and weaves together live music, documentary, and rare vintage guitars to tell the epic story of how a simple musical invention had a revolutionary impact on the world. The already sold out show took place on the 11th, 12th and 13th January and was something truly unique. On the opening night there was a panel of experts who either play the guitar or have worked closely with the greats… Razorlight frontman Johnny Borrell, musician and MP Kevin Brennan, ex The Fall guitarist Brix Smith Start and a man who has worked closely with some of the best from Pete Townsend to Jimmy Page, manager Bill Curbishley, who also produced the exhibition. The stage was set to look like a vintage recording studio (its as though you’d walked into Abbey Road Studios and any minute George Martin would walk in with a Beatle). The Seven Decades band then performed songs from artists such as Led Zeppelin, Jimi Hendrix and Rage Against The Machine. 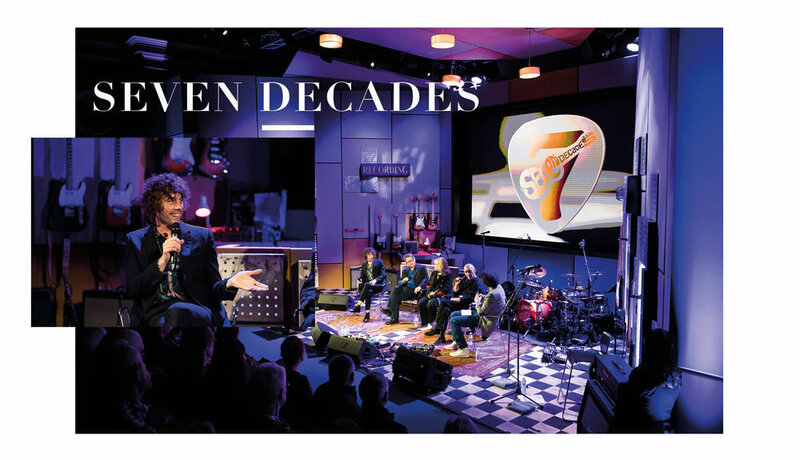 Seven Decades really managed to capture the essence of the importance of the guitar through the music it helped shape and the way that the exhibition was put together really brought the audience closer to these great musicians and wonderful instruments that deserve to be in the spotlight. Dec 26 Lalla Bronshtein's Eco–Concious Sustainable Column: Xmas Party Sparkle.